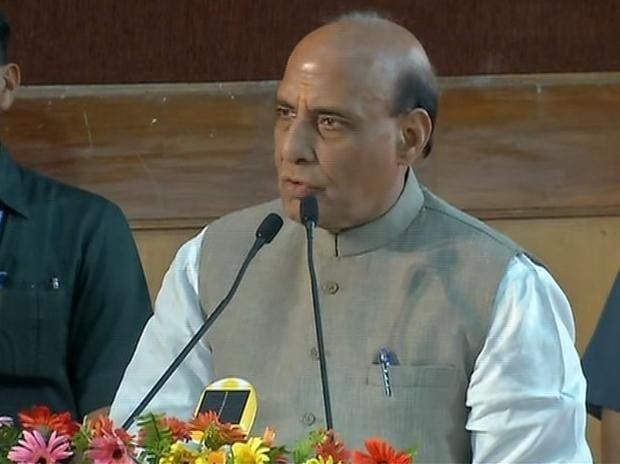 Home Minister Rajnath Singh Thursday said the government is willing to hold elections in Jammu and Kashmir along with General Elections which are slated to be held by May. Jammu and Kashmir was last month placed under President's rule, six months after the BJP pulled out of Mehbooba Mufti- led government and the state was put under Governor's rule. "If Election Commission wants (to hold elections in state along with general elections), our government will have no objection," Singh said replying to a debate on proclamation of imposition of Central rule in the state. "We are willing to provide whatever security force Election Commission wants for holding elections there" he said. Rejecting opposition criticism that BJP's "unnatural" alliance with PDP had alleniated population, he reeled out statistics to drive home the development without appeasement agenda of his party. "There was no conspiracy not to allow any other party to form the government," he said in response to opposition charge that the Governor did not allow National Congress, PDP and Congress to form an alternate government. "Allegations are being heaped on us but I want to make it clear that our intentions cannot be doubted," he said. "We do not want any sense of alleniation in people of the state. We want to minimise it and neutralise any sense of alleniation." "There was this perception that BJP leaders are against talking to Hurriyat... but when an all party delegation visiting the state asked us about talking to Hurriyat, we encouraged them to do that," he said. "But when these leaders went, doors of Hurriyat were closed. They did not even talk to these leaders." The Home Minister said he had told the chief minister Mufti to try and speak to Hurriyat. "We were ready for unconditional talks. They did not respond to our initiative." "In 1995, there were 5,938 terrorist incidents. In 2017 there were only 342 terrorist-related incidents," he said. "Our endeavour is that there should not be a single act of terrorism." He said this was not the first time that Governor's rule had been imposed in the state. The state has been under President's rule for six years in a row at one point of time. The Governor's rule was imposed as no one came forward to form government. "When after six months the Governor's rule was ending, the Governor said he spoke to political parties once again and nobody had come forward to stake claim for forming a government and so recommendation was made for President's rule," he said. Earlier, Leader of the Opposition and senior Congress leader Ghulam Nabi Azad attacked the BJP for "destablising" the government in the state. He alleged that the BJP tried to split Congress, NC and PDP in the state to form its own government.